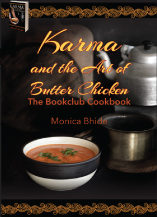 Karma and the Art of Butter Chicken (Bodes Well Publishing, 2016) is now up for pre-order!! 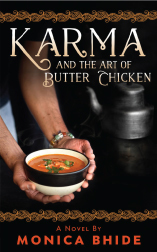 Karma and the Art of Butter Chicken paperback now available in the US! The prep work always began on Thursday night. In 1980 when I was 10, we lived in the Middle East, and Thursday was the start of the weekend. I’d huddle with Dad in our small galley-style kitchen as he began making butter chicken: a glorious dish of chicken pieces marinated in yogurt, cumin, fenugreek, ginger and garlic, oven-roasted and cooked in a sinful, creamy butter and tomato sauce. “The first thing is the chicken,” he would say. “If the chicken is not of good quality, you can forget the dish. The frozen chicken on the market is no good.” Working closely with his butcher — my father still has a closer relationship with his meat vendors than most people have with their doctors — he would pick out the best chicken and have it chopped up his way. My father is an engineer by trade. When we were kids and lived in Bahrain, he traveled constantly and was often gone for long periods of time. After a day at school, I’d wait for his return, rather irrationally, by the large windows of our cozy family room each night. When he finally came home — from Beirut, Dubai, Alabama, Delhi, London, Kuwait or Paris — he brought gifts of unusual foods, such as peanut butter, baked beans with bacon, Lindt chocolates and dates stuffed with pistachios. However, when he asked, “What would you like to eat this weekend?” the answer was always the same: butter chicken. As the memories of Moti Mahal filled his mind, he would begin to recite poetry by Indian legends. I understood nothing because I spoke no Urdu, yet his soothing, deep voice kept me entranced as he sang and cut slits into the chicken so the marinade would be absorbed. Then he added the chicken to the marinade, rubbing it until it seemed as though the chicken was born with the mixture on. The chicken needed to marinate overnight. And I needed to go to bed. Once after returning from London, Dad did not stop talking about chicken tikka masala — a British version of butter chicken. “It had onions. Who puts onions in butter chicken? I found out that it was originally created using a can of tomato soup? Soup in making butter chicken? Who does that?” The rant took several years to die down. His messy hands reached out to the spice cabinet for the treasures that made the dish sparkle. “Smell this methi, child, here, smell,” he said. “When I was a kid, my mother would make it and it made the whole kitchen smell like paradise. Moti Mahal did not add this to their chicken dish. They should have.” I leaned over and pretended to smell the dried herb, which smells like maple syrup, all the while reveling in the precious time with my father. He’d place the chicken pieces single file on a foil-lined sheet to roast in the oven as we began preparing the sauce. Then he would fish out his ancient grinder. He made me smell the pungent ginger, and he laughed as I scrunched my long nose at the garlic. Both went into the blender with fiery green chilies to make the paste. It was time to cook. Butter would go into a hot kadai, a large steel wok-shaped pot, as he would regale me with stories of his college days or how he agreed to marry Mom without even seeing her first. In went the paste and the fresh tomatoes. He would stir, pause, analyze, stir and use the back of his spoon to mash the tomatoes. Then he stopped and pulled the roasted chicken from the oven. “Now is the secret nobody knows,” he would say as he pointed to the pan. “This marinade has all the flavors from the spices and the chicken. This is what makes the masala real.” He tilted the marinade into the wok. I watched him smile, frown and finally look at peace as the tomatoes cooked to his satisfaction and the oil moved out toward the sides of the wok. Then he added the chicken and cooked it until all the flavors melded. My job came at the end. I gently cut the side of a plastic pouch of heavy cream and poured it into the chicken. The dish was complete. And it was time to invite everyone to eat. Years later, my son asked me to make butter chicken for him. Reluctantly, I did. He tasted it and declared, “It is really good, Mom, but his is better.” Ah, the relief I felt. I still need my dad to show me how. 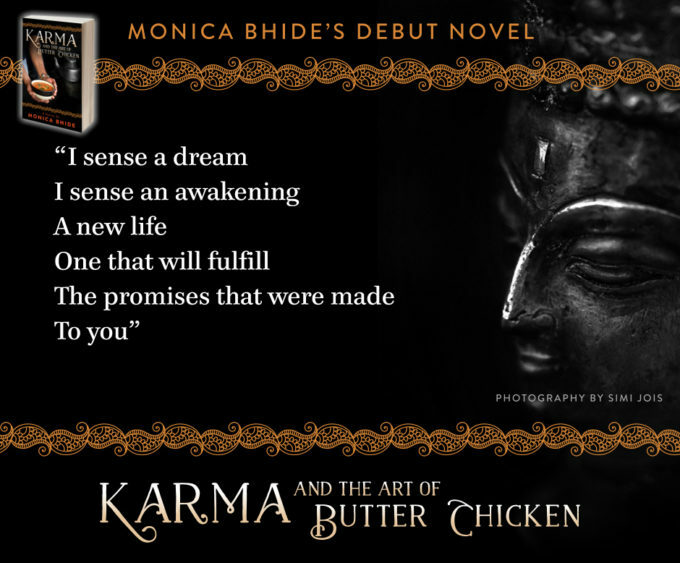 I am delighted to share that my first novel – Karma and the Art of Butter Chicken – is available for sale now in the US, UK and Canada (India release coming soon). The book is available in print and ebook on Amazon, Kobo, Kindle, iBooks and Nook. A big huge thank you to Simi Jois for the fantastic cover photograph of both of the novel and the e-cookbook. And to our super secret model who modeled for the cover of the book. A heartfelt thanks to the GW Magazine for the story they did on me. The photo used in this post – on the slider – is thanks to the magazine. They are terrific and I am so blessed to be an alumna of such a wonderful school. Washington, D.C., Virginia and Maryland friends, fans and family: Lots of in-person events coming up! Stay tuned. I will be posting more here!